The shoulder area works hard during virtually every type of upper-body weightlifting exercise, flexing or helping your upper body remain motionless throughout your workout. This makes your shoulder and shoulder blades particularly susceptible to injury while weightlifting. Because it can sometimes signal serious injury, it is important to understand what can trigger pain in your right shoulder blade during or after weightlifting and how it can be remedied. Pain in the right shoulder blade as the result of weightlifting can run from mild to severe. It can occur suddenly when you are weightlifting, when you are moving the arm from side to side or even while you are at rest. Additional symptoms can include stiffness, swelling, tenderness, radiating pain from the shoulder to the side of the arm, loss of motion, lack of strength and throbbing. The pain can make it difficult to move your arms or lift objects, such as weights, over your head. 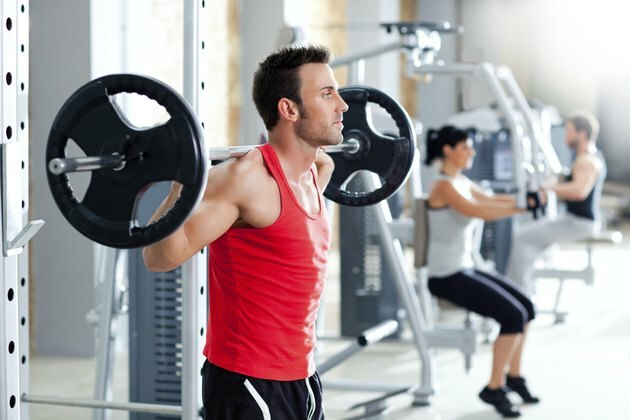 Weightlifting-related pain in the right shoulder blade can develop if you overuse the shoulder blade or surrounding muscles, ligaments and tendons with excessive weightlifting, lifting weights that are too heavy for you or not taking 48-hour breaks between working the same muscle group. Pain can also develop if you drop a weight or object on your shoulder or fall while weightlifting. Suddenly changing directions or dropping your weight load forcefully rather than in a controlled motion can sprain or strain ligaments and muscles in the shoulder area. Conditions such as bursitis, tendinitis and impingement can also trigger pain in the right shoulder blade during or after weightlifting. Rest you shoulder and avoid weightlifting for about 48 hours. Place a cold pack or plastic bag full of ice against your shoulder blade for 20 minutes at a time for up to five days. Elevate your shoulder to help fluid and blood drain away from the injury, which can help reduce pain and inflammation. Take an anti-inflammatory medication such as ibuprofen to help ease shoulder pain. A doctor can also provide corticosteroid injections for severe cases to help speed the healing process or surgically repair serious injuries if needed. Although shoulder pain as the result of weightlifting is not typically dangerous, you should seek medical attention if the pain is disabling, sharp, lasts longer than two weeks or is accompanied by extreme swelling, a fever, bruising, redness or a rash. These could be symptoms of a more serious condition or possible infection that must be treated by a doctor.